This year’s annual Red Vajrasattva drubchen led by Sang-ngag Rinpoche. Khenpo Ugyen Wangchuk arrived early to instruct the staff on all levels of preparation and practice, from playing instruments to making tormas, and, drawing from his wealth of experience as chant leader and khenpo, instructed us on practicing the sadhana. Lamas Padma, Tsering, Norbu and Thubden attended, as well as sangha from 17 different countries. Click on the picture above to visit the gallery. For a large album of photos of the sangha, look here. Enjoya brief clip of Rinpoche greeting the lamas and sangha before a session. This year’s Rigzdin Dupa practice at Ati Ling eclipsed the most popular event of the weekend, the annular solar eclipse of the sun, which occured during the close of the event on Sunday. During the three day event, 100,000 tsok offerings were made, and Jigme Rinpoche taught on Jigme Lingpa’s profound practice each morning and afternoon. Lama Padma Dorje, Lama Padma Gyatso and Lama Thubten also participated. For more photos, click on the picture below, or this link. A full collection of photos can be found here. The Red Vajrasattva practice is held at Rigzdn Ling yearly, and this year’s event was the first drubchen held in the newly remodeled shrine room, and marked the beginning of Losar events a celebrations. Khenpo Ugyen Wangchuk tirelessly help with preparations and taught the staff many ritual practices, and was Umze for the practice. Tulku Sang-ngag Rinpoche was Vajra Master of this retreat that had many signs of success. Here is a slide show (with a link to the gallery) of a few photos from the drubchen. Click on the photo to begin. The staff and participants worked very hard to make the drubchen a success. Here’s a time-lapse movie of a few minutes during the final set-up for a fire ceremony on the last day of the retreat. It’s winter at Rigzdin Ling, and, although the drubchen was largely held under clear, crisp and cold skies, a valley fog often forms along the river, and slowly changes as the sun rises and the day warms. …. During retreat at Rigzdin Ling, Tulku Sang-Ngag Rinpoche bestowed the Vajrakilaya empowerment and also consecrated the Varakilaya statue that has been in the Shrine Room for many years. Months and months of intense work went into repairing, finishing and polishing the statue, before the consecration, and now Vajrakilaya once again sits next to Red Tara on the shrine. Click for a slide show of the consecration. 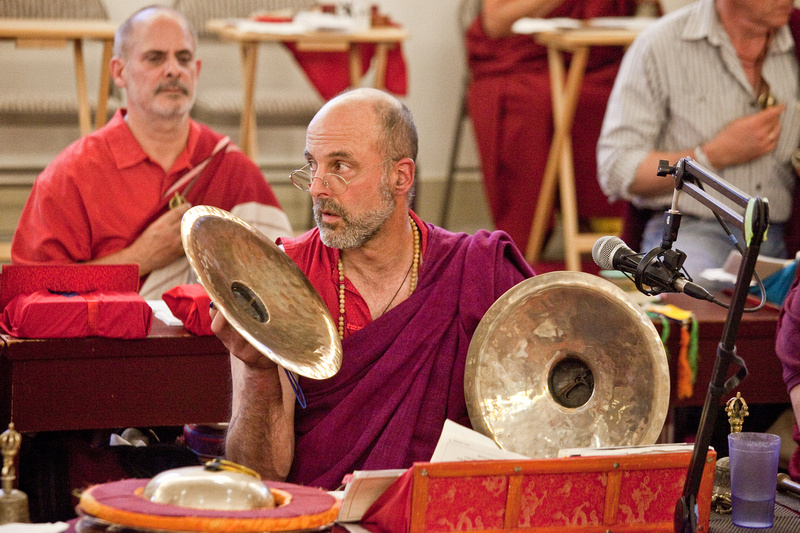 The drubchen for the Kusum Gongdu Chenrezig practice was held again this year on Orcas Island. 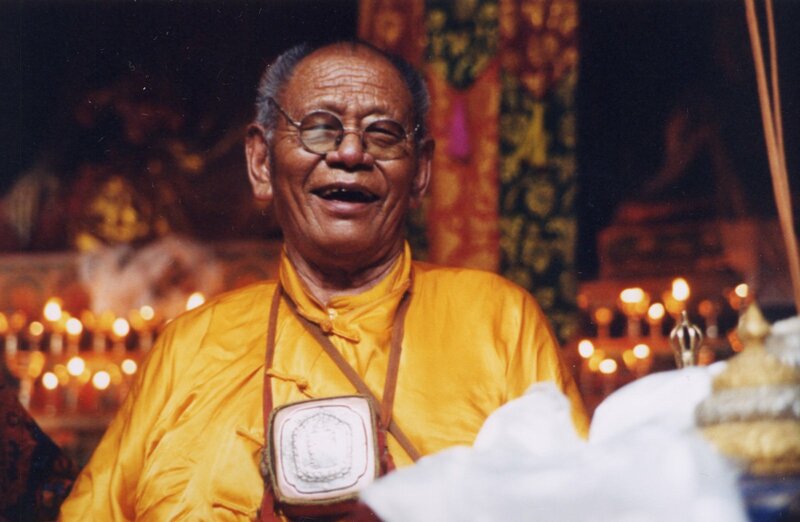 Lama Padma Yontan Gyatso (Richard Baldwin) was the Vajra Master, and Chagdud Khadro and Lama Thubten also attended. Members of the sanghas of Amrita in Seattle, Ati Ling in California, and Vajra North in the Yukon, as well as others, gathered together for inspiring practice, hard work and friendship. Click here for the album, and to download pictures, or enjoy the slide show below with sound. Akhyuk Rinpoche, one of the senior-most teachers of the Nyingma school residing in Tibet, has just passed away. A student of Tromge Arik, serving him for thirty-three years, he endured great hardship to be with his teacher during the Cultural Revolution. Later, he taught widely and together with the late Khenpo Jigme Phuntsok (1933-2004), Akhyuk Rinpoche revitalized the study and practice of Tibetan Buddhism in Eastern Tibet, eventually drawing tens of thousands of students from across Tibet and China to his Buddhist encampment of Yachen Gar, which is just around the corner from Tromge Gonpa. May all beings benefit from this very auspicious occasion! Vajrakilya Practice at Ati Ling was held between Western New Year’s and Losar. Chagdud Khadro, Padma Dorje Rinpoche and Lama Thubten attended, and Jigme Tromge Rinpoche was the Vajra Master. Click on the picture for a slide show. The Rinchen Terzod, “The Precious Treasury of Termas”, is a collection of over 700 empowerments from the 100 great tertons, assembled by Jamgon Kongtrul with the help of Jamyong Khyentse Wangpo, in the 19th Century. Through the efforts of Venerable Gyatrul Rinpoche and his students, the Rinchen Terzod was given for the first time in the West, by Venerable Yangthang Rinpoche. They took place through December, January and February at Orgyen Dorje Den in Alameda, California. Click here, or on the picture above, to view a slide show of the empowerments. To go to the gallery, click here.